This article is published in collaboration with the regional portal Bilten.org. The Romanian Parliament in session. On December 11 Romanians voted for a new Parliament. Their option was clear. The Social Democratic party won 45% of the vote and with their allies, the Liberal Democrats who got 6%, will have a narrow majority. Even if in terms of actual votes the Social Democrats did not fare too well (3,2 million votes), this being the parliamentary election with the lowest turnout in post-communist history, they nonetheless got a huge win. It is the first time when the party comes close to the 50% mark. 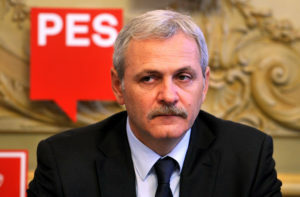 In the past, the Social Democrats, the biggest Romanian party, was unable to pass the 37% mark and had to rely on unstable alliances to govern. After an equally impressive win in the local elections this summer, now they have control over the Parliament and will control the government as well. They have never been so dominant in the post-communist period. There are two reasons for their success, which, I believe, makes for an interesting story beyond the particularities of the Romanian case. It is a special case in Europe as a whole, which may help us throw a different light on events around the continent. First, the social democrats came to power in 2012 in a large coalition and on an anti-austerity agenda. By and large they kept their promise and reversed the harsh austerity measures of the 2009-2011 period (some of the harshest in the EU). Under the Prime Minister Victor Ponta they doubled the minimum wage, lowered the VAT, encouraged consumption, increased tax collection and resumed state spending, including for social welfare. Of course, these were paltry measures compared to the needs of the second poorest country in the EU, but after the criminal austerity policies they were much welcomed. Lower-income people and much of the middle class of the smaller cities benefited. In the past a party with deep roots in the poor countryside, now the social democrats gained votes en masse in all the small and big cities. Their landslide victories in Bucharest showed that the urban proletarians and petite bourgeoisie was in synch with their message. Another important effect of their anti-austerity measures was to capitalize on the anger of the state employees. Austerity policies demanded that their salaries be cut by 25% in 2010. For teachers, doctors and nurses this was a catastrophe – since they were poorly paid to begin with – and as such they all turned to the social democrats when their salaries were not only brought to the previous level, but also slightly increased. Therefore, the anti-austerity measures were a crucial aspect in redrawing the popular base of the social democrats. I think this aspect was largely underestimated in the period leading to the 2016 elections and, more generally, it was overlooked that Romania introduced some of the most comprehensive anti-austerity policies in Europe after 2012. But this is just half of the story. The other half is that just as the social democrats were reversing the austerity, at the same time, paradoxically, they were moving towards the right. Victor Ponta was implementing anti-austerity measures just as he was proclaiming himself the most pro-business PM in Europe. He left untouched the Labor Code passed in 2011, which basically made employees vulnerable and expendable, offered state subsidies to the big companies and foreign capital, kept the inequality-inducing 16% flat tax and lowered the VAT close to 0% for particular businesses linked to the party. The minimum salary was doubled but by that it only came close to 200 EURO net. This trend took almost libertarian proportions prior to the parliamentary elections when the social democrats promised 0% taxes for incomes under 400 EURO and a flat tax of 10% for incomes above that sum, 0% tax for dividends, rents and other incomes and further lowering of the VAT tax. The party aimed to cover a broad spectrum, combining center-left promises for lower income segments and center-right polices for the entrepreneurs and big capital. While everywhere in Europe and the US this extreme center position, as Tariq Ali calls it, crumbles, in Romania it was a winning card. Paternalism for the poor, subsidies for the big capital, combined with a socially conservative agenda. It was a recipe for success, one that invited comparisons between the Romanian social democrats and Hungarian FIDESZ or Polish PiS but it was also a strategy that preempted the articulation and electoral success of the far-right. Secondly, the success of the social democrats was not only of their own making, despite their clever strategy of crowding out the center. It was also an outcome of the complete failure of liberalism. The Liberal party, the main competitor simply imploded in 2016. In 2014 they managed to win the Presidential election against all odds and with a staggering number of votes (over 6 million). In these elections they barely passed the 1 million-vote threshold and got less than 20% of the seats in parliament. They are in disarray and the most plausible fate for them is disappearance in 4-year time. To begin with, the party had internal problems leading back to a 2014 coalition with the former austerity party. While the Social Democrats were reaping the flowers of the anti-austerity policies, the liberals had to explain their alliance with the same people that introduced the harshest austerity measures in Europe. Unsurprisingly, this had little chances of elating the electorate. In addition, together with the President, the Liberals forced the resignation of Victor Ponta after the fire in Colectiv club that killed almost 70 people in November 2015. But they did not claim political power for themselves. Instead, they supported the technocratic government led by Dacian Ciolos. This proved to be an experiment that failed. With no clear political mandate and making a host of errors (especially by refusing to increase the minimum wage as planned by the Social Democrats and generally by referring derogatorily to the lower classes), the interim government offered the Social Democrats a punching bag. To make thing worse, despite an unimpressive record, the Liberals promised in the campaign to support Ciolos for a new mandate as PM, even though he did not register formally as a Liberal candidate. The lack of cadre and of political vision was there for everybody to see. Furthermore, these political blunders were magnified by an unexpected ideological turn. Many of the top echelon party members are in cahoots with the Baptist Church, very strong in Transylvania. As a result, they took on board the conservative message of the Church and of the Coalition for Family–a Church-sponsored civic organization that has elevated the struggle against gay marriages and abortion as its main agenda. Earlier this year they initiated a petition signed by 3 million people that aimed to change the Constitution in order to prevent gay marriage. 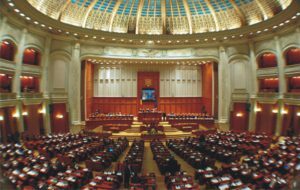 The organization became so powerful within the liberal party that the first place for Senate in Bucharest on their parliamentary list was given to one of their notorious members. 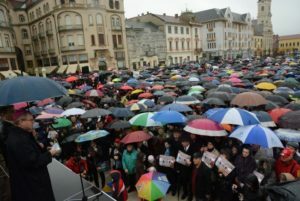 This switch towards Christian fundamentalism, which paradoxically alienated the Orthodox Church and its followers—the majority in Romania,–was accompanied by an outright flirting with the extreme right. 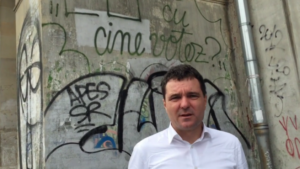 One notable figure was proposed to become the Liberal’s candidate for the mayor of Bucharest, but eventually they ditched the plan amid public outcry. Crowded out by the social democrats on the economic agenda, the liberal tried to move even more to the right in terms of social and ideological issues, confronted also with the fall of liberalism elsewhere in the world. But they were unable to replicate the right wing populism of Trump or that of Brexit and they were not in a position to do so either. They misread the local situation completely and by abandoning the basic tenets of liberalism (human rights, formal bourgeois democracy, equality, minority rights and so on) they deprived themselves of the last weapons they had against the increasingly socially conservative social-democrats. To put it differently, if everywhere else liberalism is defeated by external opponents, here the liberal themselves abandoned liberalism in an attempt to mimic its opponents. It backfired spectacularly. Nicușor Dan, the president of the newly-formed USR. The main beneficiary of the liberal implosion was a small party, USR, formed only few months ago, that combined a very strange agenda, which mixed anti-establishment rhetoric with an unflinching support for the technocratic government and the anti-corruption campaign. They got 9% of the vote mostly from disillusioned liberal voters. The trajectory of the party is unclear especially since it has no local structures, no identifiable ideology or program and no real popular support except for a handful of experienced activists and disenchanted young voters. Social democracy is being defeated everywhere in the world, including its US derivative, Clintonism, by a wide range of rightwing populist forces. In Romania, in 2016, the situation was the exact opposite: the social democrats, buoyed by a thick social basis that appreciated their anti-austerity policies, defeated the right-wing forces of a collapsed liberal center. Now they dominate the center and are the biggest and most influential party in the country right now. They are here to stay. While they sporadically mobilized the nationalist card and even tried to play on anti-EU sentiments, the Romanian social democrats are patently pro-EU and pro-US – another difference from what is happening in the region. What is the explanation for this? It is, again, the economics. Romania resumed economic growth immediately after the crisis and it registered the biggest growth rate in Europe. Much of this growth is based on depressed wages and low return for labor. In Romania the returns of capital are the biggest in Europe and the share from the national net income disproportionately in favor of capital (60% for capital, 30% for labor). This is has been our secret recipe for growth. But this reservoir of cheap labor is being exhausted and the economic growth based on this model has reached its limit. Also, the strategy of depressed wages simply pushed people out of the country, especially professionals like doctors, leaving the country with a huge deficit of cadres in this area. As I have been writing for this platform before, small state spending, especially investment for infrastructure, in the past 27 years brought the country on the brink. The old communist infrastructure that was used in transition is now crumbling and it is becoming an obstacle for further growth. The social democrats vowed to change all this and now they have the mandate and the power to do so. It remains to be seen if that will be the case. Should they fail, however, they will unleash such massive energies that they will face the same fate of the social democrats around Europe.